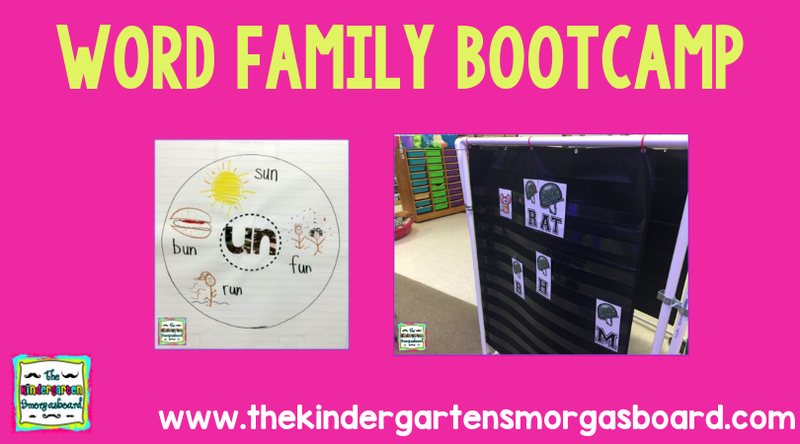 After we finish our ABC BOOTCAMP we move onto word families using TKS Bootcamp’s Word Family Bootcamp! Word Family BOOTCAMP allows to apply what we learned in ABC BOOTCAMP. The students use the sounds we mastered in ABC BOOTCAMP to blend, read and write CVC words. And word families provide the scaffolding of rhyming words as well. That’s the beauty of our TKB BOOTCAMP Curriculum. Each Bootcamp builds on the previous skill and you’re also integrating multiple skills and strategies for learning to read and write and decode words. The BOOTCAMP curriculum also means you’re learning the skills in context and not in isolation! We follow a 2 day lesson when learning new word families. We do 2 word families a week. Day 1 of word family bootcamp is the circle chart. Students come up with words for the word family. I draw the word and we spell the words using the beginning sound and the word family. Then we read the word whole group and the students take turns reading the word by themselves. After we complete the circle map we read all the words multiple times to build fluency. Day 2 is word building and word writing. We review the word family from day 1, including how to spell the word family. Then we use our word family bootcamp cards to say the words and build the words. Then we read the word whole group and then students take turns independently reading the words. We also do a quick activity where we change the letters in each word and read the new words to build fluency! After we have built and read the words we write the words! I use this word writing as an informal assessment. As they finish, I check each student’s work and I work one on one with any student who needs some extra help! The newest piece of our TKS BOOTCAMP CURRICULUM are the decodable readers. We use the decodable readers in small groups for the students who need some additional practice and support with decoding the word family words. The decodable readers provide more practice with the phonics skill in context and also provide the scaffolding of having pictures to refer to! Friday we assess the words and practice reading words from both word families for that week using ESGI! 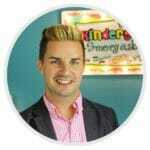 All of our TKS BOOTCAMP Curriculum assessments are available on ESGI! SIGN UP WITH THE CODE SMORGIE for a 60 day free trial and save $40 off your subscription! So how well does Word Family Bootcamp work? Here is our ESGI data from last year’s word families! Word Family Bootcamp is also part of our TKS BOOTCAMP (TM)(C) Curriculum bundle at a 50% savings if you purchase the entire curriculum! To learn more about our TKS BOOTCAMP curriculum, check out the Bootcamp page!